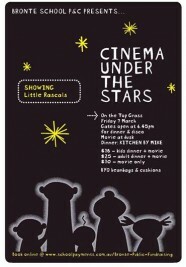 Reel Performers are proud to be sponsoring Bronte Public School’s Cinema Under the Stars tomorrow on 7th March. 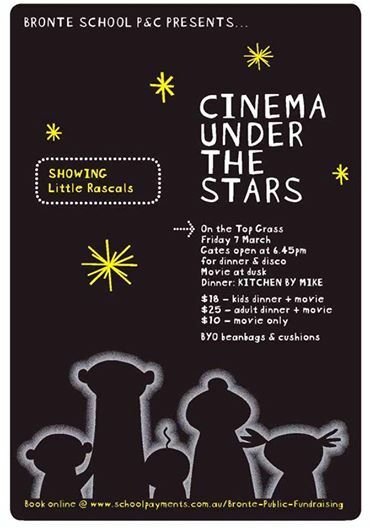 With the help of Pop Up Cinema’s – Little Rascals will be showing on the top lawn. Gates open at 6:45pm with dinner and a disco, with the movie showing dusk. Our little advert will beam onto the largest screen thus far and how exciting it will be! Tickets are $10 at the door for the movie only, or for dinner and disco with movie $18 children/ $25 Adults. It’s meant to be lovely weather and a great Friday night family activity.